We've all been handed lemons at times in our lives. And every wise grandma will tell you that you should "take those lemons and make lemonade!" A batch of lemons dumped on me one early spring day when I went out and cranked up my pop-up camper to air it out for the upcoming bluegrass festival camping season. As I turned the crank I could see tattered strips of rotted canvas blowing in the March breeze and the more I raised the roof the more dejected I became. Over the winter the roof seal around an air conditioner had failed and rotted out the inner plywood and most of the canvas. I decided it was time to dismember my faithful bluegrass festival abode. We had some great times dragging that camper around but it was time to salvage what I could and ditch the rest. Over a day or two I took her apart and saved every useful screw, light, bracket, hinge… you name it! I managed to save the mattresses and the little cushions that made the table into a third bed. The water tank, the stove, the fridge and basic frame all were saved. 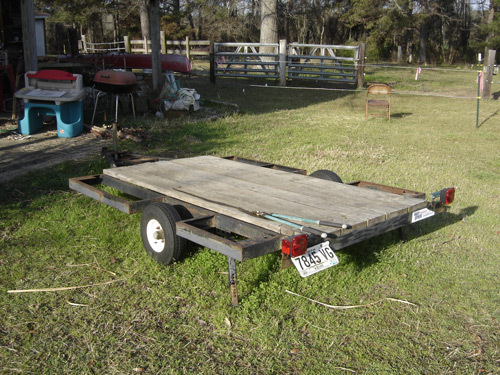 I decked the frame with pressure treated lumber and, ten years later, I still use the trailer to haul christmas trees, hay, appliances, lawn mowers and any other thing that will not fit in the truck or car. 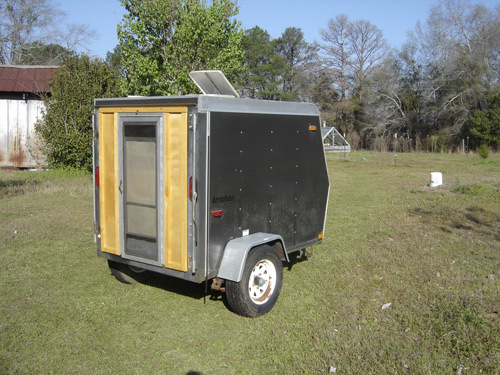 After the pop-up was dismantled I converted it to a utility trailer. But I still needed a quick overnight camper! I didn't want a little camper. I needed a camper! I have played bluegrass music for 40 years and have slept in every kind of arrangement known to man. In a bus, in a motorhome, in a cabin, a tent, in a pop-up, under a pop-up in the grass, on a porch, the rare motel room, and even on a boat! In order to keep going to bluegrass festivals and camping in general I need a place to lay my head and snooze when nature demands it. Something without a lot of fuss. Our band used a little 4' x 6' utility trailer to haul the sound equipment and instruments when we travelled to gigs around the Southeast but since moving to "the country" the trailer has been mostly creating a shadow next to my barn. My son, who was 5 at the time, liked to play in it and watching him got me to thinking. By some miracle the old mattresses from the pop-up fit the floor of the trailer perfectly! Discovering that caused me to start thinking of that little trailer as a crude, boxy teardrop camper instead of a sidelined old band trailer. This could be fun! I still had the two-part door from the pop-up camper. I just can't throw anything away! I held it up to the maw of the little trailer and what a surprise! The upper section was precisely the size needed for the utility trailer. I cut the frame of the door off and set aside the lower, knee high section. 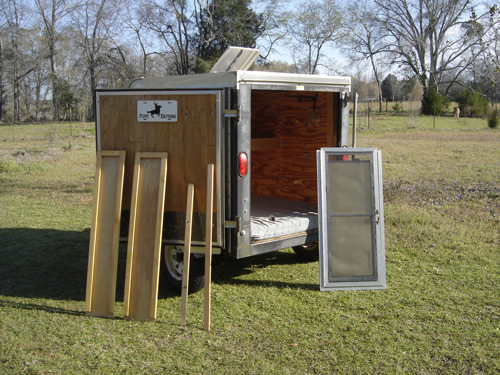 If you don't have an old pop-up camper door laying around you could easily build something to serve as a door, keep the bugs out and let some fresh air in. I just got lucky! It wouldn't be that hard to construct a similar door if you look around at Lowe's or Home Depot. Here are the various parts I devised before assembly. There is plenty of room for carrying my bass fiddle and everything else I might need at a weekend bluegrass festival. Since my young son is my constant camping companion I decided to build a "loft" for him to sleep in. I installed a 2" x 4" support frame and decked it with pine boards. The old pop-up bench cushions again, by some miracle, fit right in there and created a small bed for him. After he rolled out right on top of me in the middle of the night one time I added a little safety rail to keep him "upstairs" during the night. He is almost 9 now and has outgrown the upper bunk so he sleeps below with me and the upper berth is used only for storage and gear while in camp. I devised a horizontal 1" x 2" rail, attached with wing nuts and bolts, as the upper support for the door and closure panels. A small metal bracket is all that holds the top of the door in place. The rail is attached loosely and then the door is stuck in the center (I have some pencil marks as a guide) and two 3" screws hold the bottom of the frame to the floor of the trailer. After mounting the door and the upper rail I took some measurements and cut two 1/4" plywood panels to fit the opening with a little overlap. By dumb luck I didn't have the door dead center so the two panels ended up about an inch different in width. This turned out to be a blessing since I always know which one is right and which is left and that helps you hit the same screw holes time after time. After cutting the plywood panels I created a light frame of 1" x 2" pine and glued and nailed around 3 sides of each panel. The upper side of the panel I left un-framed so I could slip it under that upper rail. After they are in place, a snugging of the wing nuts and the closure panels are held in like a clamp. When the glue dried I gave them a couple of coats of Wipe On Poly finish and drilled one screw hole at the bottom to attach it to the floor of the trailer. Once both side panels are in place you are done. Climb in and take a nap! There is a standard screened crank-up 14" square vent on top and that, combined with the door panels opened a bit, makes a pretty nice air flow on mild nights. You could add a additional vents/windows as you see fit. The regular door cannot be closed with the "camping door" in place so when we are headed home I remove the 4 screws, stash them in a bag where I cannot lose them, stuff the door and panels in the trailer, pile in all of the other gear, shut the main door, lock 'er up and hit the road. On a typical weekend in the wild, I generally carry a 10' x 10' pop-up tent which is set up over the back end. I also carry a spare tire and a jack, wheel chocks, and stuff her full of coolers, tents, stoves, food, sleeping bags, banjos, and anything else one could ever need or want. It's really great when you get home because once you pull out the coolers, the food and the laundry, you can just lock it up and it's loaded for the next trip. My wife is exactly "five foot twelve" as she puts it and she doesn't like sleeping in this rig. I am 5'-10" and it is perfect for me, especially when "flying solo" so I can use the diagonal. 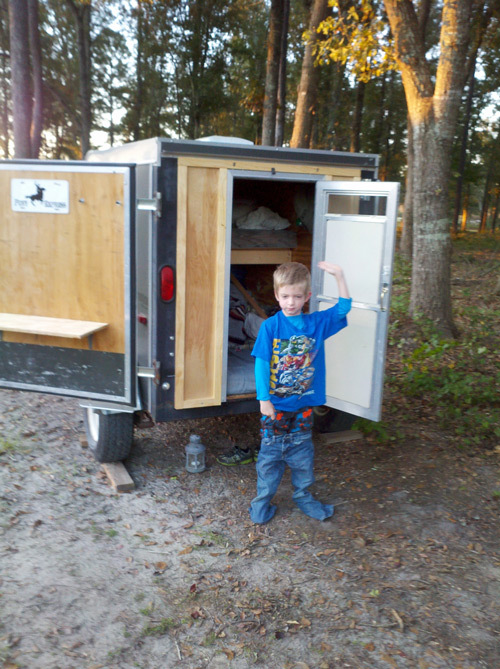 If you are on the large size you might want a 7' or 8' trailer. There are no end to the doodads and add-ons you can dream up for something like this. Let your imagination guide you and do what granny says: Make lemons into lemonade! Here's a picture of Jackson rolling out of bed one morning a few years ago at the Brickyard Plantation Bluegrass Festival. That was back when he was little enough to sleep in the upper bunk sideways. He was attempting to dress by pulling his pants over his PJs as he said "I don't need your help, Dad!" Note the added shelf on the door. Note: This article was originally written for Backwoodsman Magazine in trade for a free subscription!